Sprinkler Juice: How Much Water do you Use? When you stop and think about it, you realize that you use a lot of water on a daily basis, especially at home. But how much do you actually use? Here is a good way to find out; we've broken down the average water usage in the typical household. Keep reading to find out how much water you use. Morning and Evening Routines – You use water all day long, and that water usage starts early in the morning and goes late into the night. Every morning, you brush your teeth, wash your face, shave, and shower. With that in mind you should know that every time you fill up your bathtub, you’re using roughly 36 gallons of water and every time you take a shower you use roughly 2 to 3 gallons of water a minute, depending on the type of shower head you use. Brushing your teeth requires 1 to 2 gallons per minute. Remember that you perform many of these different activities twice a day; that’s twice the amount of water. Daily Routine – Aside from morning bath time, you have to remember that you're consulting the tap all day long: Hand washing, 1 gallon; shaving, 1 gallon; running the dishwasher, 4 to 10 gallons; laundry, 25 gallons; using the toilet, 3 gallons; watering the lawn or garden, 5 to 10 gallons per minute. Four, five, or six gallons here and there really adds up, making it incredibly easy to waste water without even realizing it. 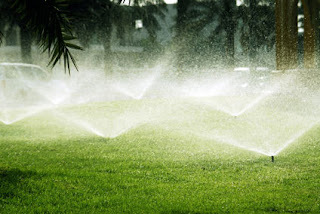 Remember that when you use water for other things like watering the garden or lawn, it could increase your water bill even more. Once you know how easy it is to waste water, you can start to monitor the usage a little better. For watering the garden, we recommend using a sprinkler timer and a rain sensor to keep the sprinkler from running too long and to keep it from turning on when it's raining.